The color green stands for life, renewal, nature and energy. This color is said to be the most restful and relaxing color to the human eye. Green is also the most common color found in nature, which makes green lights a welcome sight, especially when used outdoors. In addition to its abundance in nature, green is a staple in many holiday displays from Christmas, to Halloween, St. Patrick's Day & Easter - there are so many opportunities to fill your home with the inviting glow of green light! Green comes in hundreds of shades that mean and stand for many different things. Dark green, such is often viewed as classical, trustworthy, and well-balanced. On the other hand, bright yellow-green stands for being trendy, jealous, and spirited. Olive green, a color that has been referred to throughout history for hundreds of years, is the traditional color of peace and love. Pairing shades of green with different colors can often result in popular holiday color themes or complementary colors. For example, green and red are classic Christmas colors, light green, light blue, and light pink are Easter colors, and green with glowing orange or purple is perfect for spooky Halloween displays. Support Your Team with Green Light Color Combos! In addition to its abundance in nature, the color green is a common sight in a variety of social settings. Many different sports teams use specific shades of green to identify themselves. The Green Bay Packers, Seattle Seahawks, Michigan State Spartans & Boston Celtics are just a few teams who have chosen to use shades of green to represent themselves to the world. Different countries also use many different colors of green on their flags such as Brazil, India, Ireland, Italy, South Africa and more. In addition to the use of green in sports team and national colors, the term "Going Green" represents a growing environmental practice which people participate in to help protect the environment and sustain its natural resources for current and future generations. Many decorators have even switched to energy saving LED lights instead of incandescents in an effort to "go green" while still enjoying decorative lighting for holidays & events. 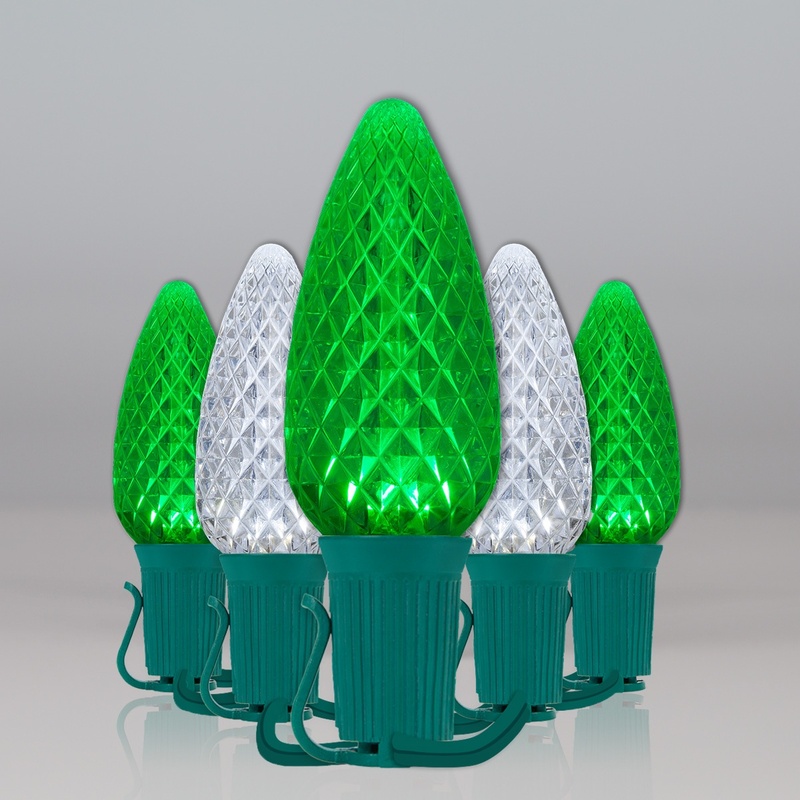 Gorgeous green lights are a perfect way to decorate and create something amazing for numerous holidays! 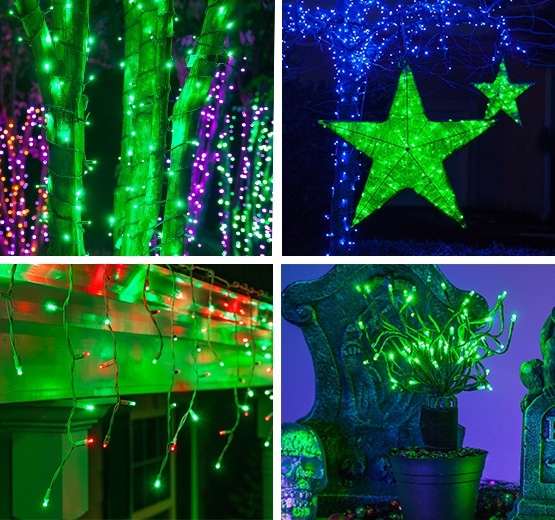 Green lights are often seen illuminating homes and parties for Christmas, St. Patrick's Day and Halloween. Decorating with green lights in combination with red and white lights is popular during Christmas to create festive lighting indoors and out. During Halloween, you can illumimate your home with green, orange, and purple lights for the ultimate mystical effect. Halloween themed net lights can be draped across bushes and coordinating icicle lights look extra spooky lining a porch or fence. Green starburst lighted branches are stunning if you place them in hanging or still flower pots along with other decor such as fake spiders, cauldrons, bats or cats. The result is magically eerie lighting! Blue and green energy efficient LED lights can be used to brighten your indoor & outdoor spaces while also representing your passion for Earth Day. Parties and events can be illuminated with green mini lights or C7/C9 lights hanging from the ceiling or across outdoor gathering spaces. Even if you don't have an occasion to celebrate, you can hang a few strings of green light, or hide a rgb strip light set on green in a room or entertaining area for a relaxing and enjoyable escape anytime! If you are looking to create a masterpiece or just to hang a string of lights in your entertaining area, we have a wide variety of green LED and incandescent lights for you to choose from! Love green lights but not sure where they'd look best? Our decorating ideas can help you with some creative lighting options! Hang green and red icicle lights and white Moravian stars off your front porch for a festive Christmas look. Shining a green and red laser light onto a house or trees is an easy and eye catching way to give a finishing touch on your house for Christmas. Dangle green LED icicle lights off your porch and hang green and cool white starlight spheres for St. Patrick's Day. Place green Starburst lighted branches with green LED twinkle lights in flower pots or hanging pots along with hanging Halloween themed lights on your porch for a mysterious and magical touch. Bring attention to the largest environmental movement, Earth Day! 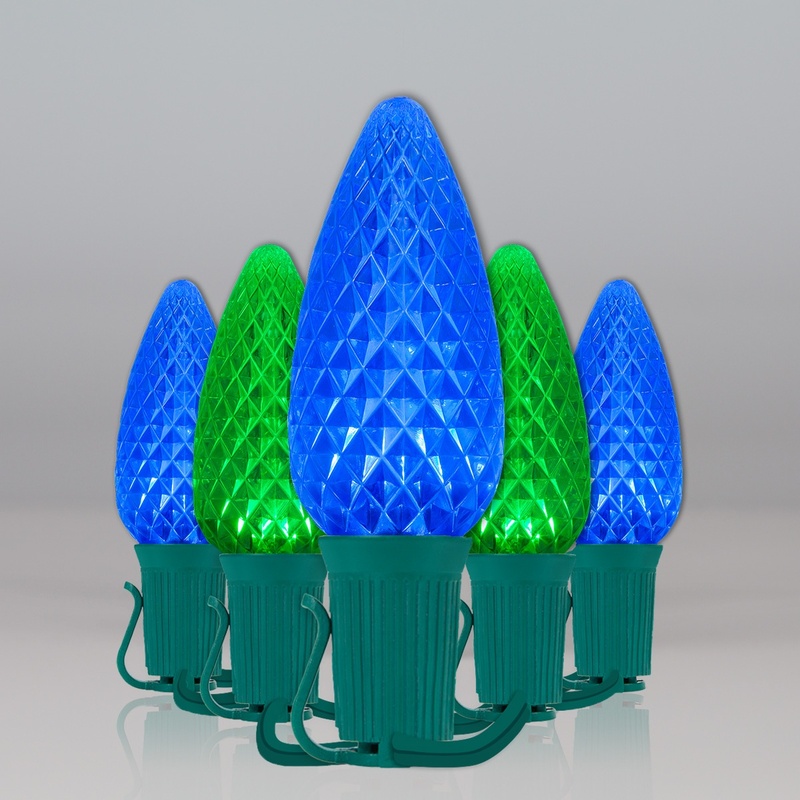 Decorate your yard with green and blue starlight spheres and wrap your trees with blue & green combo LED mini lights. Drape green LED mini lights and light fabric across the ceiling of a wedding, event, or birthday party for a gorgeous & elegant atmosphere. 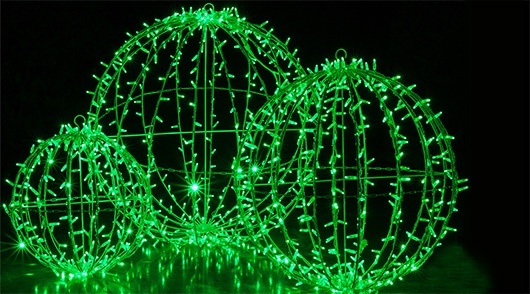 Hang a Green LED Christmas Light Ball from branches, patios and porches or above an indoor seating area. The hollow center is ideal for filling with flowers, greenery, ribbon, or anything your imagination can think of! Hang green light strings or hide a multi-color strip light in a room or entertaining area to create a relaxing and enjoyable escape! Line your driveway with green C7/C9 bulbs or a combination of green and other complementary colors to greet guests during Halloween, Christmas & events. Green rope light can be used to wrap around buildings, frame rooms, line yard/driveway, light up parade floats and so much more! The decision between LED or incandescent green lights often comes down to a few factors including visual preference, price, and size of the display. LED lights are energy saving, allow for more strings to be plugged together on one power source and are incredibly durable making them perfect for large scale and long term lighting displays. LED lightsare also available in a greater variety of bulb styles & sizes than incandescent versions, allowing for a wide range of decorative applications. Although there are many benefits to choosing green LED lights for decorating, LEDs are a greater initial investment than incandescent lights. So, if you're only planning to use a few light strings periodically throughout the year or are on a budget, incandescent lights might be just what you need to get the job done. No matter which bulb type you choose, if you're reading this there's a good chance that you love the color green which means you're in the perfect place to find what you need. 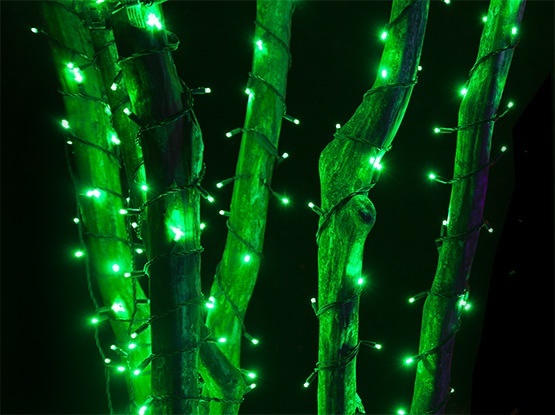 We have hundreds of green bulbs, string lights and decorations available to create any design you can dream up!